Roast the peppers on a comal or frying pan on high heat, until the skin is completely blackened; remove from heat. Place the roasted peppers in a plastic or paper bag for at least 10 minutes. Remove the skin, seeds and veins. Process in a blender along with sour cream and chicken stock. Preheat oven to 350° F. Spread 1/2 cup of pepper sauce on the bottom of a baking dish. Combine spinach, ricotta cheese and chopped onion; season with salt and pepper, to taste. Heat the tortillas in a comal or frying pan until soft. Fill each tortilla with 3-4 tablespoons of the spinach mixture and roll the tortillas into a taquito. Place 8 enchiladas, folded side down, in the bottom of the baking dish. Add half of the pepper sauce over the enchiladas and sprinkle with 1 cup grated cheese. Repeat the process with another layer of enchiladas. Bake for 30 minutes or until the cheese starts to bubble. Remove from oven and serve. Serve with Mexican rice and refried beans. Looking for new ways to add more vegetarian dishes to your weekly menu? 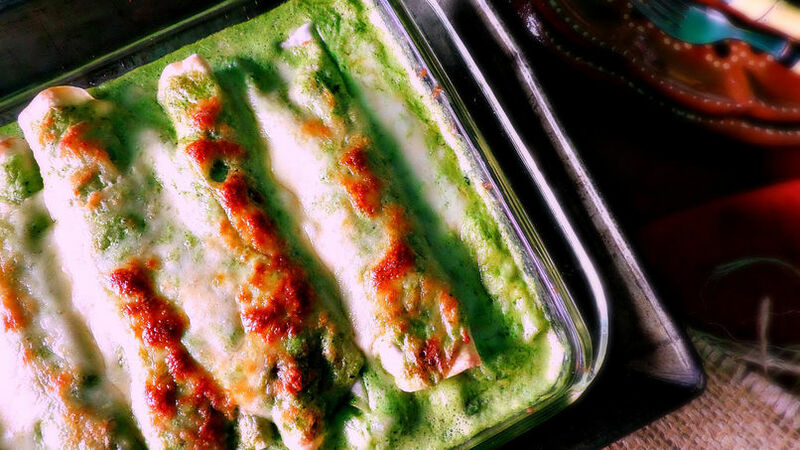 These enchiladas stuffed with spinach and ricotta cheese are a delicious option. Why? Because who can resist a tasty Mexican enchilada?